It may come as no surprise, but Americans are watching more and more online video. In fact, they’re practically jonesin’ for it. According to comScore’s numbers, 182 million Americans watched online video content in September (for an average of 19.5 hours per viewer), while the U.S. video audience tallied a total of 39.8 billion video views. But what may be a bit more surprising is the extent to which people are now watching their video on tablets. Ooyala, the provider of online video technology and services just released its first quarterly review, which you can find here. While the data is skewed slightly as it only takes into account those who actually watch online video, as comScore’s numbers show, at least in the U.S., there are more than a few watching online video. And Ooyala’s data set, too, is considerable, as the platform handles more than 1 billion analytics pings per day — revealing the global viewing behavior of 100 million monthly unique users. From Ooyala’s study comes a number of interesting interesting conclusions. 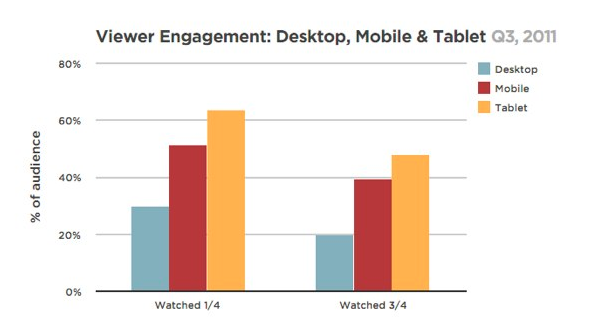 First and foremost, tablets are seeing a significantly higher level of engagement in online video viewing, as tablet viewers watch longer than viewers of desktops or mobile devices. For each minute watched on a desktop, tablets recorded “1:17 in played content”, which works out to 28 percent longer than the desktop average. What’s more, tablet viewers are more than twice as likely to finish a video than desktoppers, as the completion rate for tablet viewers was double what it was for desktop viewing in the third quarter of this year — and is 30 percent higher than that of mobile devices. Of course, the high level of video engagement compared to desktops isn’t just limited to tablets, it seems it’s true of all mobile devices, too: In Ooyala’s words, “viewer engagement was generally higher on mobile devices than on desktops — even for long term videos”. Yup, mobile viewers completed three-quarters of a long-form video at a rate of 20 percent, compared to 18 percent for desktops. In terms of long-form videos, the study found that desktops and laptops are more likely to be used for short video clips, whereas videos that are 10 minutes or longer make up 30 percent of the hours watched on mobile devices, 42 percent on tablets, and nearly 75 percent on connected TV devices and game consoles. While desktops still make up the bulk of total video displays, plays, and number of hours watched, mobile devices, tablets, and connected TV devices are increasingly shaping (and changing) viewer behavior. For non-desktop video media, mobile devices owned the biggest share of total hours played, with 48 percent, while plays on tablets accounted for 45 percent. While connected TV devices lagged behind in most categories, as the industry is still in its nascency, Ooyala believes that these devices are closing in on the tipping point, as video plays on connected TVs tripled in Q3 alone. Of course, when it comes to video being watched on mobile devices and tablets, it’s all iOS and Android. 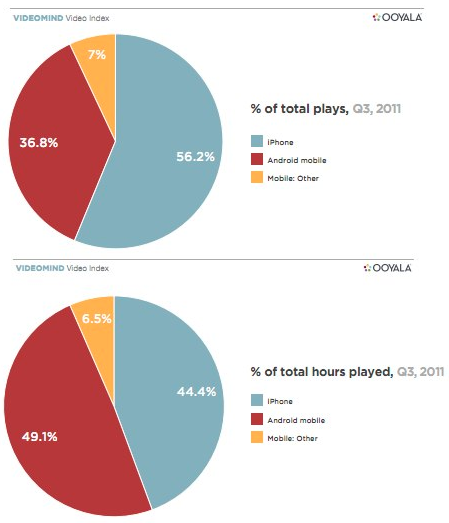 Combined, Android and iOS devices make up 90 percent of the video hours for tablets and mobile devices. For tablets, unsurprisingly, iPad is king. iPads were responsible for 99.4 percent of displays, 97.7 percent of total plays, and 95.7 percent of total hours streamed. However, thanks to its growing lead in marketshare among mobile devices, Android is seeing an average conversion rate of 45 percent — one that’s considerably higher than that of iPhones at 22 percent. For tablets, Android devices were also higher at 47 percent compared to iPads at 13 percent. In terms of viewer engagement for tablet viewers, the percentages were close, but iPads grabbed the higher percentage of completion rates (at 38 percent compared to Android’s 36 percent). Also of note: As Erick reported back in August, Facebook had jumped into third place among the biggest video platforms, with an estimated 51.6 million people watching videos on Facebook in July. Facebook’s numbers have since dropped slightly, but the point remains: When it comes to display advertising and now video, Facebook is growing at a scary rate. To this point, Ooyala found that Facebook is across the board a more popular means of sharing video than its social media rival, Twitter. In the U.S., for every one video shared on Twitter, over eight are shared on Facebook. As to how much more popular Facebook was than Twitter as a video sharing platform — that varies widely depending on the region. In Japan, there’s a 1:1 ratio, whereas in Italy Facebook is 17 times more popular. In the end, Ooyala’s study seems to prove how it is becoming of increasing importance for content publishers to develop strategies for tablets. With viewers watching 28 percent longer per play on tablets compared to desktops, the publishers are now beginning to be guaranteed to have access their viewers’ eyeballs for a longer period of time. No doubt advertisers will be taking note of this. For a full dive into Ooyala’s study, download it out here.